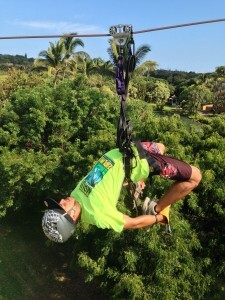 At Maui Zipline we provide a safe and family friendly environment to experience zipline adventure. Safety is the number one priority when our guides are on the course with a group. All equipment and the course are visually and tactilely inspected every morning and then continuously throughout the day. Guides fit guests with harnesses and helmets to the correct fit before every tour. They also provide safety information and take questions before ever even ascending one of our towers. It is this strict focus on safety that we are able to provide one of the most fun and thrilling portions of the tour… THE TRICK LINE. After line #1 and #2 guests are feeling more confident with the concept of flying on a wire. They have experienced the braking procedure and can correctly demonstrate the proper landing position. On line #3 they have the opportunity to show off their new skills and really let loose. This line is affectionately known as “The Cadillac Line.” It’s long, smooth, and we love to trick it out. The tour guides encourage guests to let go of the equipment and go hands free. 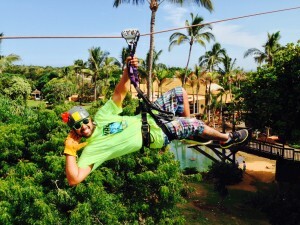 If a guest is feeling even more adventurous they can attempt one of the many patented tricks performed by our guides. A trick can be anything from dancing, sports, animals, letting go, or just acting plain crazy. Some of the most popular tricks are: The Scorpion, Sizzling Bacon, Superman, Mr. November, Gun Fight, 360, Disco, The Robot, Gangnam Style, Flying Buddha, Triathlon, Lazy boy, Trust Fall and many more. This line provides the best opportunity for memorable photos and will surely be a highlight of your Maui vacation. What really makes the trick line special is the fact that not only are some people conquering their fear of heights, but they are having fun doing it. 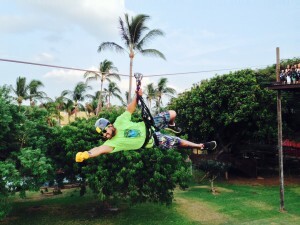 Come join us at Maui Zipline and show some style on the trick line.